Think back, to a time when keys in your pocket, gas in your tank, and the open road was your definition of freedom, instead of just a way to get from point A to point B. Do you remember what it felt like to actually be EXCITED by driving? Well, it turns out you didn’t lose it. You just misplaced it among the bills, demands and responsibilities that come with adulting. Even better news: if you hurry, you can still catch that feeling again behind the wheel of a new 2018 Dodge Challenger! 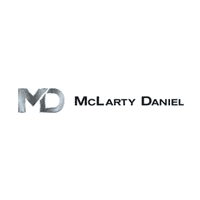 If you’re looking to buy a 2018 Dodge Challenger near Fayetteville, Arkansas, stop in today at McLarty Daniel CDJRF in Springdale. We’ve got the 2018 Challenger in all option packages and trim levels, ready to put a big smile on your face! PERFORMANCE: Performance is the name of the game when it comes to the 2018 Dodge Challenger, and the Challenger plays to win with your choice of four incredible engines. Standard power under the hood is the unbeatable 3.6-liter Pentastar V6, putting out a stout 305 horsepower — more than most “high-output” cars of only a few years ago, while still achieving a stellar 30 mpg highway. For true performance, step up to the legendary power of the 5.7-liter and 6.4-liter Hemi V8s, delivering 375 hp and 485 hp respectively. If your agitation for acceleration is even stronger than that, pony up for the ponies put down by the incredible, 707 hp 6.2-liter SRT Hellcat Hemi, topped with a low-profile supercharger. Every Hellcat comes with two keys: a black key that reconfigures the onboard computer to allow for “only” 500 hp for day-to-day driving, or a red key that unleashes all 707 of those angry horsies for pedal-to-the-metal fun. HANDLING: Back in the old days, Challengers only had to go fast in a straight line to impress the heck out of Mopar devotees and haters like. These days, though, modern drivers expect more from their cars, and the high-tech suspension under the 2018 Dodge Challenger reflects that, with a series of performance-oriented upgrade packages to augment the already-great suspension under the Challenger. The sport-tuned suspension package, for instance, including stiffer springs, heavier sway bars and sBilstein high performance shock absorbers, plus a half-inch lowering kit and steering calibration for a more responsive ride through the twisties. For ultimate cornering fun, there’s three-mode adaptive damping system found on all SRT models, including the Challenger SRT Hellcat. The system allows drivers to select from three different driving modes depending on what they want their Challenger to do, including Street Mode, Sport Mode with increased stiffness, and Track Mode for maximum suspension stiffness for slot-car like handling during high-speed cornering. 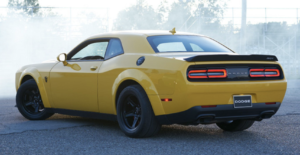 TECHNOLOGY AND SAFETY: While old school muscle cars pretty much tossed anything that didn’t help with go-fast, leaving them fairly spartan affairs, the 2018 Dodge Challenger is packed with high technology and entertainment options. Controlled from the high-definition touchscreen in the center stack, the available SiriusXM satellite radio features over 160 channels of programming, including music, sports and talk that can be piped through the available Harmon Kardon audio package, with 18 speakers, including two subwoofers, and 900 watts of power. Keeping your hands and eyes where they’re needed, meanwhile, is UConnect voice command hands-free calling, with voice prompts and voice commands that can also operate the turn-by-turn navigation system. Getting you there in one piece is an advanced airbag system, including multi-stage driver and front passenger airbags, front and rear side curtain airbags and front seat mounted airbags, all standard. The excitement, freedom and joy of the open road is still out there, and it’s calling to you. All you need is a great car to find it, and the 2018 Dodge Challenger is that car. Whether you go for ultimate fuel economy or ultimate performance, there’s a 2018 Challenger that’s right for you, and we’ve got them here at McLarty Daniel CDJRF in Springdale. Shop our big selection online, then stop in soon for a test drive. Do it now. The road is waiting.